One of the first things that parents think about when they find out their child will need a spica cast is, what am I going to do with this child for the next 6-12 weeks??? The good news is, you can do a LOT with a child in a spica cast! Sure, there will be some things they won't be able to do, but there is also a lot they CAN do! All it takes is a little creativity! Chalkboard! Every IvyRose chair comes with a reversible tray with a chalkboard on one side. I recommend sidewalk chalks for the littlest artists. 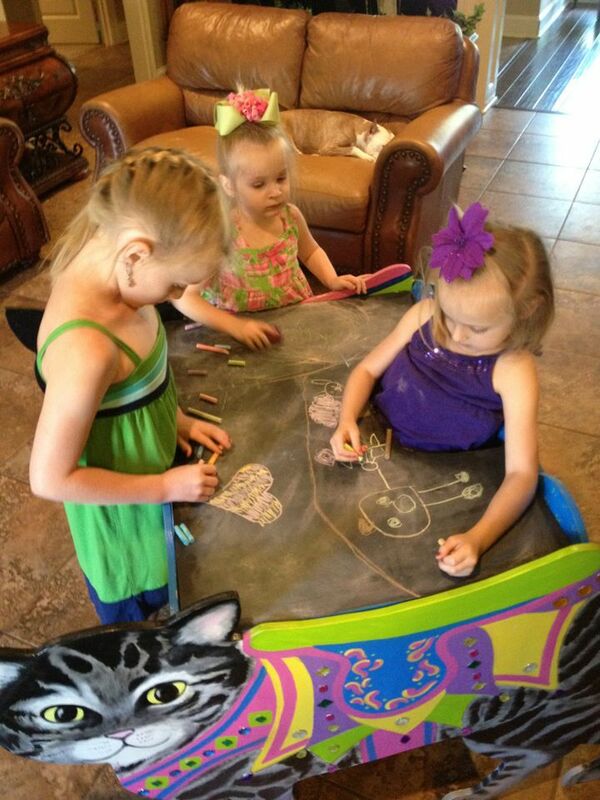 The trays are big enough that siblings and friends can join in the fun! Color! Coloring books, sheets of printer paper, newsprint or even notebook paper and a box of crayons are all you need! Cutting paper! Give your child a pair of safety scissors and some old magazines and let them cut out pictures or just cut it up into confetti. This has the added benefit of helping them work on their fine motor skills. Paint! Watercolors are great, or you can still find those paint-with-water books that have the paint already on the page. Finger painting can be lots of fun, just use a big waterproof apron/bib. You can even use edible finger paints using instant pudding mix and food coloring! Petting Zoo! If you know someone who has small animals, you can ask for them to set up a mobile petting zoo. Water Tray! This one will require some preparation, but if you're ready to mop up a bit when they're done, it can be great fun! Use a big waterproof apron to protect your child's cast, and you can put a garbage bag over the tray table to make sure it stays dry. Then get a shallow plastic tub, fill it with about an inch or two of water, add bath toys and let them play. You can even use baby shampoo to make bubbles if you want. Bubble Fun! Soap bubbles are great for any age, you can blow them yourself or let your child blow them. You can get non-spill bubble tumblers at most "dollar stores" to prevent messes. Kitchen Utensils! They can use them to pretend to cook, or just use them as musical instruments to make lots of fun noises. Play dough! You can buy some, or you can make your own play dough. Since they can't run around with it, the mess stays contained in one spot and is easier to clean up. A handfull of cookie cutters and a rolling pin and you can make "cookies", or just let them go free-style. Puzzles! You can buy all sorts of puzzles at thrift stores for a couple dollars each, so you don't have to break the bank to have a variety of puzzles on hand. Read Books! You can use your own, but you can also check out board books or picture books from your local library. Most libraries will even pick out a selection for you that you can just have someone pick up for you if you ask. Lacing Beads! Extra large beads and a long string teach your child fine motor skills. Dress Up! You can make up your own dress up box and fill it with Marti Gras beads, old costume jewelry, play jewelry, tiaras, wigs, hats, feather boas, scarves, gloves, sunglasses, etc. A good, sturdy make-up mirror will let your little princess see how stunning she looks. Thrift stores are a great resource for inexpensive dress up items. Dominoes! For older kids, dominoes make a fun matching game. Memory Card Games! You can use just a small handful for younger kids, or add more to increase the challenge for older kids. Building Blocks! Wood blocks, foam blocks, duplos or waffle blocks, kids will have fun building them up and knocking them down! Matchbox Cars! Use them alone, or with the blocks to make ramps and houses for your cars. Craft Box! Get a shoebox or other small container and fill it with crafting supplies like pipe cleaners, pompoms, colored macaroni, sequins, foam shapes, feathers, glitter glue, construction paper, paper plates, paper bags, googly eyes, and lots of glue sticks. 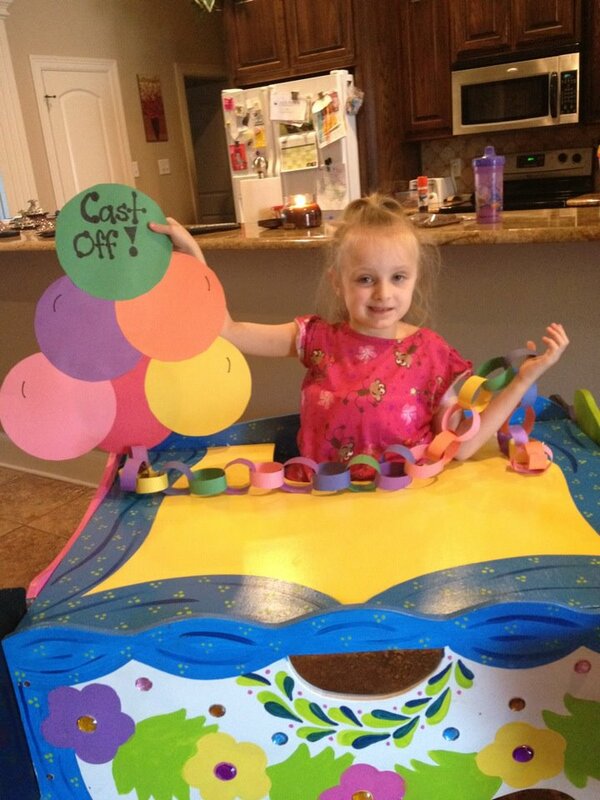 You can make puppets, masks, or just cool art projects that will keep them busy for hours! This clever family made up a special paper chain to count down the days until she gets her cast off! Host a Tea Party! You can use toy dishes or real ones, invite "real" friends or just their favorite stuffed ones, sip "tea" and eat yummy snacks. Bake Cookies! Let them be involved as much as you are comfortable with, you can let them help add the ingredients, help stir, or just help drop the cookies onto the cookie sheets. Every kid loves to bake cookies! Go for a walk! While it is more of a challenge, you CAN get out with your spica kid! Many strollers can be adapted to work with the cast, an umbrella stroller with a pillow tucked in it worked well for my daughter. Wagons with high sides can also be padded with pillows for the ride. And of course, you can use a baby carrier. I used a MeiTai that worked well for us, and I've heard good things about the Ergo. Go Shopping! You can use carriers or strollers or you can even bring along a beanbag and tuck it in the shopping cart! Go Fishing! Grab a pole and go spend a day fishin'.